BRIC countries (Brazil, India, China, Latin American and South Korea) top the list of consumers who are “very concerned” about environmental problems and related health impacts. Meanwhile, China and the US top the list for the largest emitters of greenhouse gasses. 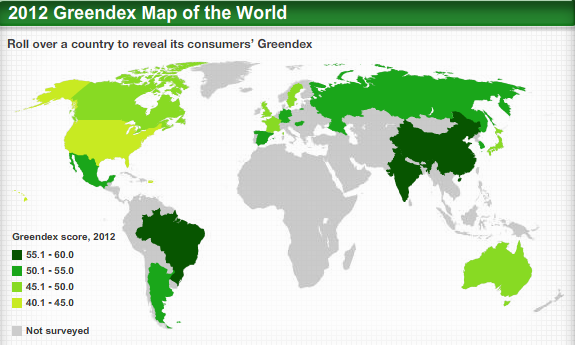 So says the fourth annual Greendex survey of environmentally sustainable consumption. Canada isn’t far down the list from the US and China as a country that partakes in sustainable consumption. (Sustainable consumption is defined as “consumption that demands less of the ecosystem services that the Earth provides, and is less likely to impair the ability of future generations to meet their own needs as a result.”). While an argument can be made that certain European countries may be less concerned about environmental problems because of their strong existing environmental protection policies, this study also reveals an apparent lack of concern for the nature and extent of the global environmental issue. With countries like Canada having the largest amounts of energy consumption and waste creation, it is quite obvious that we seem to take what we have for granted. Another interesting result from this survey was the discovery that “consumers in developing countries expressed considerably more guilt over the environmental implications of their behavior.” It was also worthy to note that these countries also felt the least empowered in their ability to create the kind of change to address environmental issues. Social enterprise can be the solution to addressing the global environmental crisis as incorporate environmentally-friendly/sustainable products into the daily lives of individuals without greatly changing their daily activities (i.e. providing similar-to-mainstream products at a similar quality and price range) may be a way for developed nations to use their size and purchasing power in a positive way. Instead of trying to make individuals realize where the blame lies or why they should feel guilt, we must work within societies to create change internally. By finding ways to make sustainable consumption a realistic part of the lives individuals in countries such as the US, and finding ways to empower BRIC nations to take their desire to make a positive environmental impact and turn it into something tangible – we can overcome this hurdle. Maybe in another survey a few years down the line, we can have a collective global voice that believes in sustainable consumption, no matter how rich or poor that nation may be.